April 5th is the anniversary of First Contact Day, when Humans and Vulcans first met on Earth! 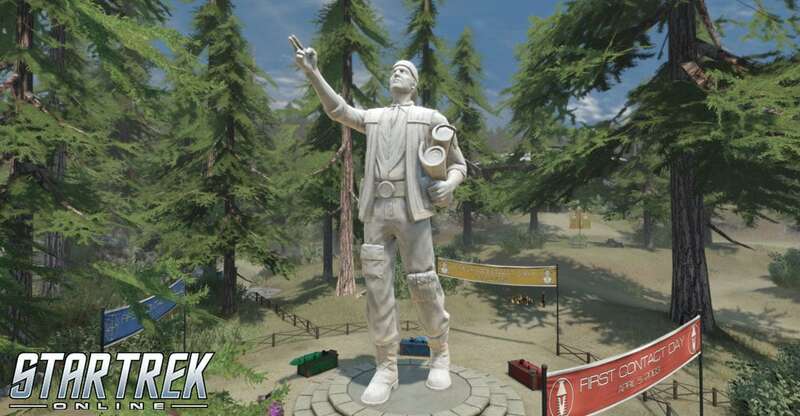 To celebrate the anniversary of First Contact Day, the Zefram Cochrane Memorial and Historical Museum is holding a special re-enactment event from April 5th at 8am PT to April 12th at 10am PT, on all three platforms!. Participants are invited to visit to Bozeman, Montana—the site of Cochrane’s launch of the first Human warp-capable ship, the Phoenix—and engage in the construction of their own replica Phoenix! Captains who participate will search the area for useful parts, just like Cochrane scavenged the pieces for the Phoenix. Using these parts in conjunction with a basic hull assembly, captains will make their own model of the Phoenix by combining engines, hull, and stabilizer parts found in various bits and pieces scattered about the re-creation of the historical settlement. Under the shadow of Zefram Cochrane’s statue, try to get the best parts possible, because the engines will make your model go faster, hull will allow it to survive longer, and stabilizers will keep it going at a better angle of launch. Once captains have had a few minutes to collect their parts, they’ll return to their unfinished models and use leftover pieces to improve on the pieces they’ve assembled. After that, everyone will assemble at the missile silo to launch the models. Whoever’s model reaches the highest altitude will be declared the winner of that launch and the honorary student of Cochrane. Captains of level 10 and above may participate in this event—even captains from the Klingon Defense Force and Romulan Republic are welcome to join these festivities, as a celebration of diversity and the meeting of different species. The Bozeman Hyper-Impulse Engines are specifically designed for enhanced flight speed. They feature a modified fuel injector that increases speed when at full throttle, but it comes at the cost of some maneuverability. The Bozeman Hyper-Impulse Engines will be unlocked for your entire account once the task is completed on a single character, and will be available to reclaim through the Dilithium Reclaim Store. A replica Toy Rocket resembling the Phoenix, Zefram Cochrane’s legendary warp ship, as seen in the First Contact Day event. A special Holo-emitter for your shuttles and fighters that will make your ship look like the Phoenix. This device has an unlimited duration, unlike those provided by the Ferengi. For those who find themselves with additional Holograms after receiving the Special Event Prize Box, there will be a recurring reputation project that rewards a box of 100 marks of your choice, requiring the input of a single voucher. This project will only be available while the event is active, so turn in your vouchers while you can! Please join us for a very special First Contact Day event!